CPV installations are projected to rise to 1,362 megawatts in 2020, up from 160 megawatts in 2013, according to the new report entitled “Concentrated PV (CPV) Report – 2013” from IHS Inc. Installations will expand at double-digit percentages every year through 2020. CPV installations are projected to rise to 1,362 megawatts in 2020, up from 160 megawatts in 2013, according to the new report entitled “Concentrated PV (CPV) Report – 2013” from IHS Inc. Installations will expand at double-digit percentages every year through 2020, as presented in the attached figure. 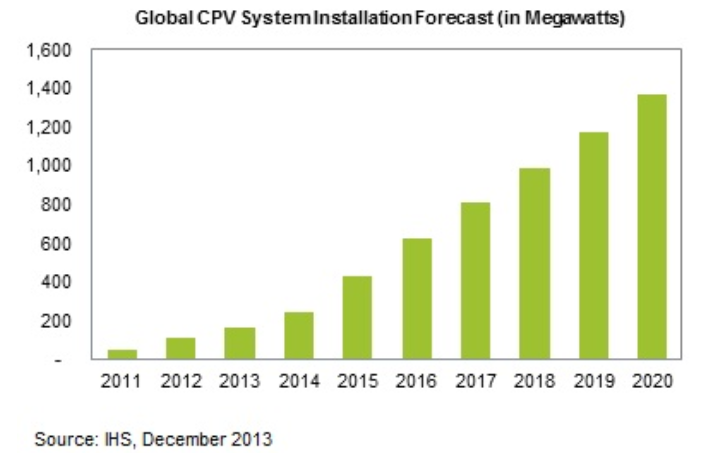 Nonetheless, the situation is changing rapidly as advancements in CPV technology reduce costs. Prices for CPV are retreating as manufacturing processes progress down the learning curve. Average installed pricing for high-concentration PV (HCPV) systems are estimated to have decreased to $2.62 per watt in 2013, down 25.8 percent from $3.54 per watt in 2012. The decline is being driven by rising volumes and improved system efficiencies.